With visual content booming, one word too often still strikes fear into the heart of content marketers – infographic. Add “series” after “infographic” and it can sound like madness to the uninitiated. How can you gather the stats and communicate a clear message while making them look good in a set? Don’t panic! Creating an infographic series can be much less painful than it sounds – and even, sometimes, quite good fun. The secret is in following a clear framework, enabling you to tell a clear and consistent visual story in one of the most powerful ways possible. Before even thinking about stories or visuals, start with the planning. Do plenty of desk research, report reading, and even some original data gathering, such as a survey. All of this activity gives you the insight to decide on the theme of your infographic series with confidence. 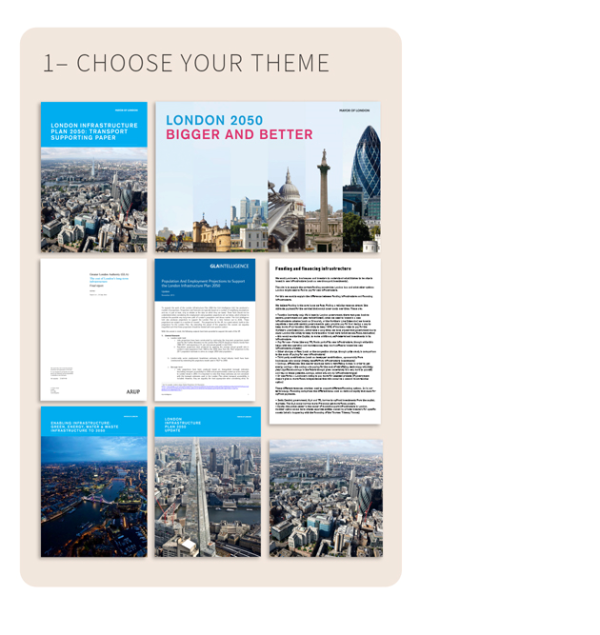 When whittling down your theme shortlist, constantly ask yourself two questions: (1) Why would anyone care about this and (2) Does this work with our overall content marketing strategy? Once you can answer yes to both, you’re onto a winner. It might take a while, but being diligent during this phase will make the next steps much easier. 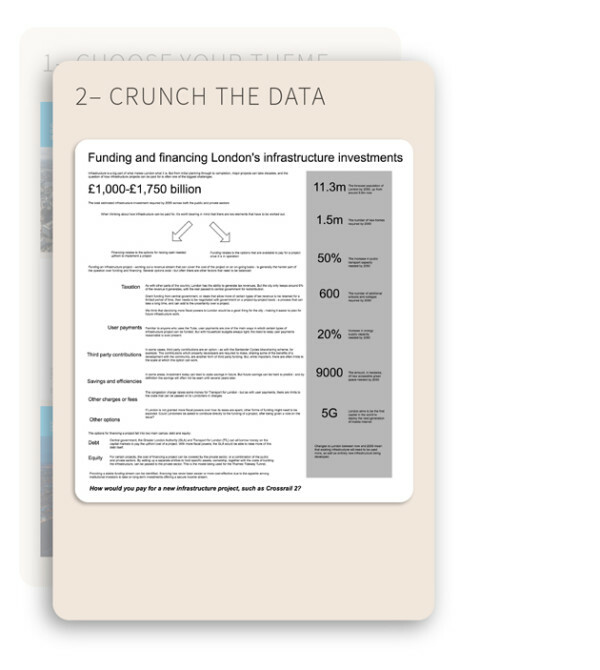 Example: We were tasked with producing a series of 10 infographics for the Greater London Authority, an administrative body for the city. The series covers themes such as green infrastructure, housing, digital connectivity, and the circular economy. Information comes from research reports, briefings, and surveys. We think about how this data could be used in an overall package. Now it’s time to get your hands dirty with the data. Review everything you gathered, analyze, and digest the data to make sure you understand what it means. Then you’re ready to create a data map (or a story map if you’re using facts and messages rather than data) – a visual representation of the key facts, stats, and messages you want to include. Chop up the data map in a logical way, with each section representing one infographic in your series. 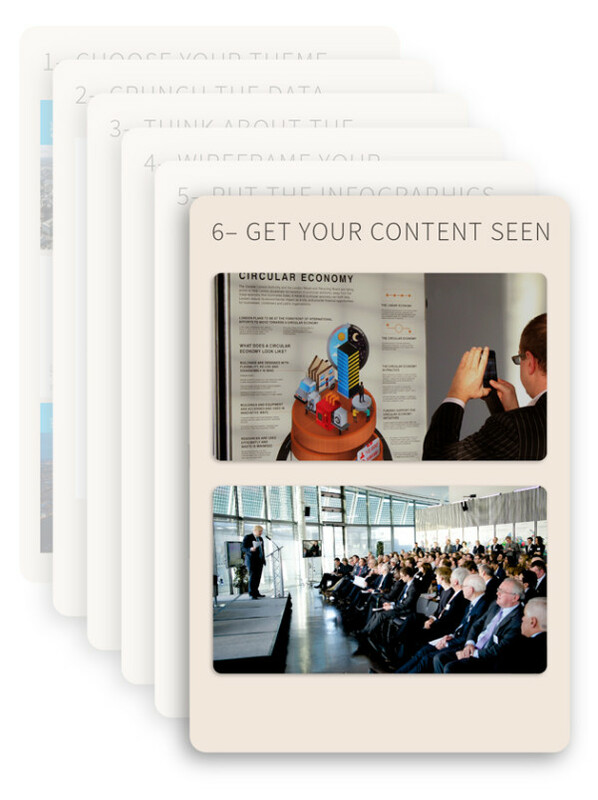 Then define the exact pieces of information you want each infographic to include. 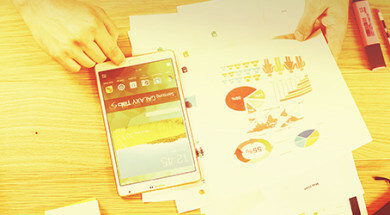 A series with three to eight infographics is usually a good rule of thumb. 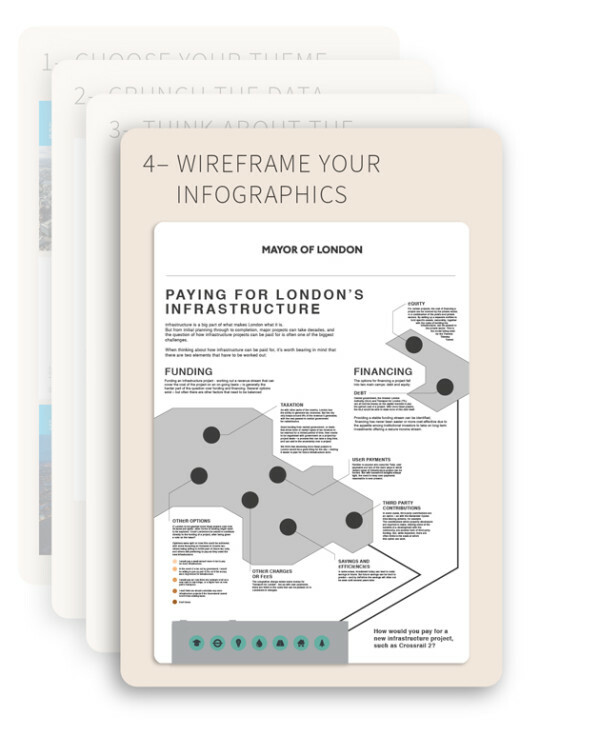 Example: This is one of the data maps for the Greater London Authority series – always the starting point for one of our infographics. It outlines the story we will tell, incorporating all of the key stats. It’s essentially a one-pager that makes it clear to anyone what the story being told is. With the heavy data lifting complete, the creative juices should start to flow. Think about how you can blend your brand’s creative identity with a fresh visual approach to make the infographic series original and eye-catching. This could mean anything from emphasizing a different part of your color palette to creating a character that appears in each infographic. Consistency and creative inspiration make sure your series hangs together and flows logically. Plus, if you’re going to reuse your assets across channels – such as in print – now’s the time to consider how that would work creatively. 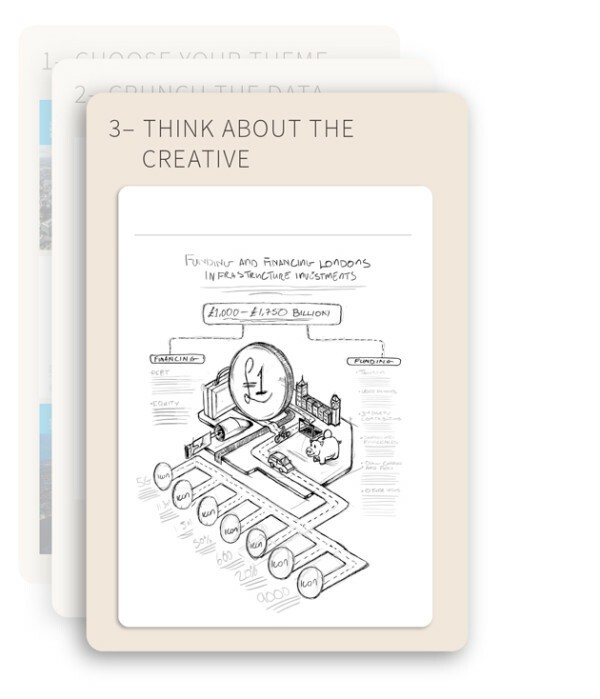 Example: We sketch the concept coming from our ideation session. Here we think about the squint test. Can the topic be noticed from a glance or squint? Is the visual striking enough to grab attention? You’ve got a theme, data, and your creative approach! The next step is to make it all official with some mobile-friendly wireframes. For the unfamiliar, wireframes are “skeleton” designs that show the elements and structure of each infographic. To create them, consider the intended user journey stage for each infographic and detail the messaging hierarchy that will work best for each stage’s user’s need. It’s also a good idea to plan atomized content at this stage – smaller cut-downs of the main infographic that present key stats or headlines to be utilized as teasers. For example, you can use the snippet on social channels and link the user to the main infographic on a website. You also can present a snippet of your content in an optimized format for the intended channel. Remember, one size does not fit all! Example: An architect designs the blueprints of a building. The structural engineer makes that vision become a reality. The wireframe ensures that the concept fits in a responsively designed consistent structure that allows all components to flow and proportion it for the size of the output. In this case, we use a poster-size output for the infographic. Now you’re ready to move to the creation stage with a focused direction. Best-practice content rules still apply to infographics – include clear headers and strong calls to action. Once those are in place, the creative team can have some fun with tone, styling, color, and visual motifs to bring the wireframes to life. Again, consistency is key to make sure the creative direction of each infographic works as part of the series, and still always ladders up to the core brand identity. Example: We develop the wireframe into a high fidelity infographic that has the creative concept of the ideation sketch, presented within the wireframe it is intended for, and aligned with the story in the data map. Once your series has been published, get ready for the big push. With organic reach on social channels nosediving, partnering with other brands that can deliver an audience for your infographic series is a good tactic. Think about who would be interested in your theme – looking beyond the traditional companies or partners. Also use paid social or content distribution tools to ensure that your series gets seen. Taking a test-and-learn approach means you can optimize your ads in real time to deliver better value. And while it’s a good idea always to link between each infographic wherever possible, avoid labelling them as part 1, for example, so that each one works as a standalone piece. Finally, wherever possible include a call to action to share the infographics to boost that all-important organic distribution. 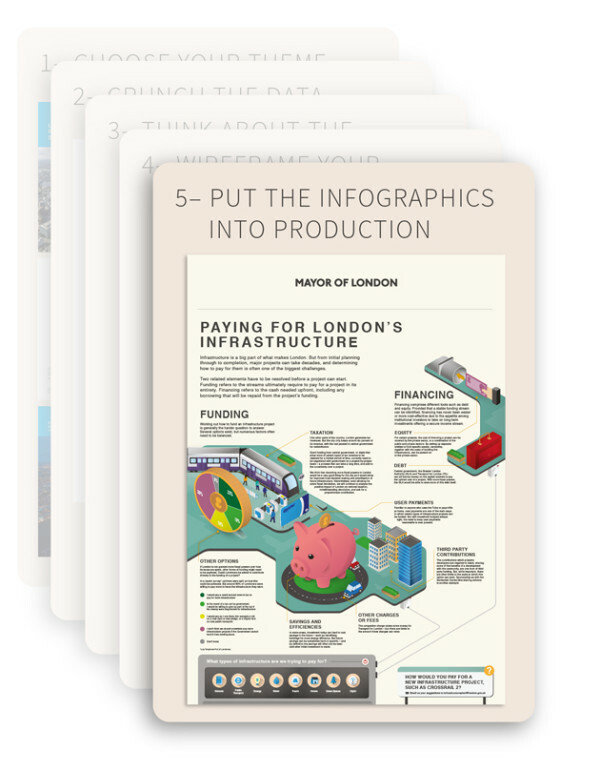 Example: As an evergreen piece of content, we wanted to make the Greater London Authority infographic series work harder. We position the print version of the series for guests to see as they wander to their seats at a city hall event. We also send a downloadable PDF to guests the following day, use it in newsletters, and feature it on the website portal through a downloadable link. Is there a powerful story and editorial flow that tells a clear story? Does each infographic suit to its target stage in the user’s journey? Do the graphics still make sense if they’re seen out of sequence? Is the brand’s visual identity clear and consistent? If you can tick all of those boxes, you’ve given yourself the best shot at getting your infographic series viewed, shared, and remembered. Stay up on the latest trends in content marketing to help you grow your content marketing success. Subscribe to the free daily (or weekly recap) newsletter. Richard Silvester is one of the emerging leaders behind the visual content movement having founded infogr8 one of UK’s most successful data led content agencies in London. You can follow his tweets @Richie_Silver or connect on LinkedIn.